I really need to cut back on my comics. Lately I’ve been scooping up series after series that have been recommended to me by the one guy at my shop, and it’s starting to get a little out of hand. There’s so much good stuff out there, though! From the feel-good roller derby shenanigans of Slam to the artsy and weird world of The Electric Sublime, comics continue to do cool things. 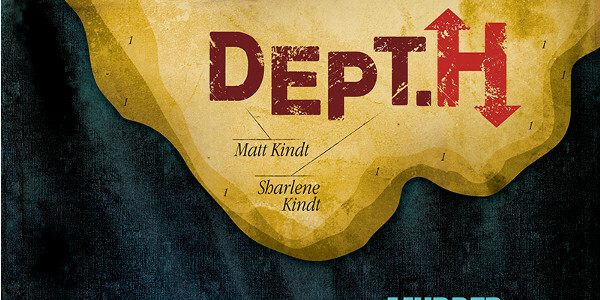 This recommendation spree began with an indie series called Dept. H, which was recommended to me based on my interest in unique art styles like Christian Ward’s in ODY-C. I wasn’t actually in the market for new books at the time—comics cost money—but the premise and art style were so intriguing that I decided to give it a look anyway. And now, at the risk of making some kind of terrible ocean/fish-based pun, I’m hooked. Some vague spoilers for the series so far (through issue #9) below the jump. At its core, Dept. H is a locked room mystery, but to reduce it to just that would be a disservice. It blends that basic premise with some near future sci-fi, spooky oceanography, and killer (no pun intended) suspense to weave a tale that’s greater than the sum of its parts. The story follows Mia Hardy, a scientist and investigator who hopes to piece together the truth of her father’s death. He was leading a research team at Dept. H, a seafloor base six miles underwater, and while the official reports say that his death was an accident, Mia is certain that it was the result of foul play. She descends to the base and begins her investigation, but none of the Dept. H team are particularly forthcoming. The fact that she has complicated history with some of them from her father’s previous research expeditions certainly doesn’t help matters, nor does the fact that she always resented her father’s decision to abandon his space exploration research for the seabase, and the Dept. H team knows it. The main story is moving rather slowly at this point—we’ve had nine issues so far, and we’re not really any closer to learning the secret of Mia’s father’s death than we were when we began. In the meantime, though, it is becoming more and more clear that all is not well at the bottom of the ocean, as seals burst, equipment goes missing, and the team grows ever more suspicious of each other. While each issue reveals some more about the team and their history, I still don’t feel like I have enough information to point a finger at any one suspect. The series is ongoing and doesn’t have a clear end in sight, though, so I have plenty of time to cultivate my suspicions. In the absence of a swiftly moving plot, the comic uses each installment to build the tone—the sense of tension, claustrophobia, and general assuredness that something is very wrong in Dept. H has increased with each issue. As a person with a strong interest in (and healthy fear of) oceanic exploration and weird ocean fauna and flora, each issue is full of fascinating takes on what lurks at the bottom of the ocean and how humans could live down there long enough to find out. As a longtime fan of Jules Verne, the designs of the deep-sea exosuits and the base itself feel like a new take on something familiar. And as someone who fears cold, watery death, the increasing tension of the series keeps me worried about Mia and hopeful that she won’t experience one. Mia is a fascinating character as well as a win for representation. She’s the audience’s touchstone character in terms of being the outsider entering the locked room after the murder was committed. We only know as much as she is able to learn, but she’s also definitely carrying baggage that we don’t know about yet that influences her opinions. She’s a brilliant scientist but not particularly personable—she clearly has grudges and past traumas that inform her often-grim personality, and her eidetic memory, while useful for research, makes it hard for her to forgive and forget when she feels someone has wronged her. To some extent, her unlikeability is a selling point to me—she’s a rare female protagonist who’s unapologetically rough around the edges, and uninterested in making the people around her comfortable. I wouldn’t even go so far as to call her a jerk with a heart of gold—she’s really just kind of a jerk. It’s still too rare that a female character has the luxury of not constantly putting in emotional labor to please the people around her. Mia’s also a person of color of Indian descent—one of the only people of that racial background I can recall from comic books full stop. The entire Dept. H team, in fact, seems to be created with reflecting the actual world in mind, as people of various colors, genders, ages, and disabilities are included in the lineup. What is most immediately intriguing to me about the comic, though, is the art. The comic is written and drawn by husband and wife team Matt and Sharlene Kindt, and it’s honestly like no comic I’ve ever read before in terms of aesthetic. The lineart is a rough, visceral sort of sketching that successfully captures both the intense emotions of the story and lends horror to the weird nonsense-creatures that inhabit the darkest oceanic depths. It’s colored with beautiful watercolors that are intense or muted by turns, depending on the scene. The design doesn’t end with the panels themselves, either; each page is formatted to look like the story has been pasted into a lined journal, and the front and back facing pages are always decorated with some kind of infographic or notation that adds further detail to the story. On top of all of this, the books—the single issues at least—are printed on a heavy matte paper that feels like construction paper, something I’ve never seen from a comic before. The overall aesthetic is unique not only in its art style and coloring, then, but also in terms of the way it feels in your hands, an interesting dimension to add in. The first trade hardcover of the series will be released at the end of this month. While the art style may not be for everyone, I strongly recommend you give it a try. It’s a fascinating and claustrophobic sci-fi-lite take on a locked-room murder mystery, and since it’s an ongoing rather than limited series, it’s up to the creators to decide when the story is over. I’m looking forward to seeing where it goes from here. This entry was posted in Comics, opinion, Reviews, Science Fiction and tagged comics, Dark Horse Comics, dept. h, matt kindt, Mia Hardy, Review, sharlene kindt by Lady Saika. Bookmark the permalink.